Get to know our bloggers! Follow us on Twitter More questions? Brock Future Students on Classes and Seminars/Labs at Brock U — How Does It Work?! Katie on Classes and Seminars/Labs at Brock U — How Does It Work?! As an upper-year student in the Concurrent Education program, I have completed tons of group projects! As a result, I have really come to see the value of collaborating with your peers for homework, assignments and especially studying. Even I can admit, however, that group work can be testing at times. So…check out these tips for a successful group project, paper or presentation. 1. Schedule a meeting time. Getting together with the other members in your group can be difficult to organize but is necessary in order to establish which direction the project is headed toward. Finding a mutually agreeable time for everyone might take a couple tries. Leave your options open and try not to be turned off by the idea of compromise; sure meeting up to talk schoolwork on a Friday evening or first thing on a Saturday morning is not ideal but if it’s the only time that works for everyone then you should make a meaningful effort to show up. 2. Figure out what type of group work style fits your personality. Finding that balanced role within your group is important. Nobody likes a “steamroller” group member who takes over all of the work and dominates when it comes to pitching ideas. On the other hand, group members that sit there silently while everyone else does the work just aren’t pulling their weight. A good group member will be a combination of both styles: assertive and confident without being pushy, open-minded and willing to listen but not lazy or disinterested. Don’t be afraid to speak up and make your thoughts known but also try to let everyone have a chance to participate – group work should be run as a democracy, not a dictatorship. 3. Is your group being marked individually or collectively? This shouldn’t really affect your work ethic but it might be helpful to know what criteria you’re being graded on. Perhaps only some of your mark is based on the group presentation while the majority depends on your personal reflection? In this case, plan your focus accordingly. 4. Divide tasks between each group member. Some group projects require the group to complete the steps together as a whole. For other group assignments, however, you might find that splitting up tasks is a more efficient approach. By giving each member a small portion to work on, the task seems manageable and won’t overwhelm students’ busy schedules. 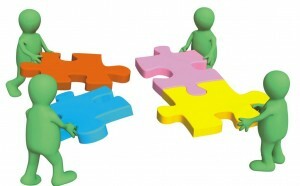 At the next group meeting these “puzzle pieces” can be fit together to form the larger picture. 5. Show up prepared. Nothing can be more awkward than showing up for a group meeting only to realize that you’re the only one who hasn’t done the readings or prepared for the assignment. It is understandable that life gets in the way sometimes and things unexpectedly pop up but this awkward situation can be avoided by sending out a message to the rest of the group before showing up empty-handed for the meeting. 6. Edit your work. If your group does decide to go with the puzzle model just be sure to edit the work so that it is cohesive and free of punctuation and grammatical errors. The paper may have been written in parts by different members but it should all sound uniform with a style that flows throughout. This is also a good time to share ideas with your group before finalizing. Maybe one member has some valuable thoughts on another member’s topic that are worth including in the final product. 7. Rehearse. Practice makes perfect so rehearse, rehearse, rehearse! Practising your project with your group before the actual presentation date is a must. This gives you a chance to smooth out any bumps, get a better sense of timing and to shake any pre-presentation jitters that might arise. This might even help you and your group to predict questions that your classmates or professor could ask about your presentation, and to prepare an answer. Hello prospective, new and returning Badgers! My name is Adrienne and I am super excited to be back at Brock again for my fourth year of the BA/BEd Concurrent Education (Intermediate/Senior) program. I’m majoring in English as my first teachable, and minoring in History, which means I spend lots of time reading! I love working with children and interacting with the Brock community and would be happy to help other students with similar interests to get involved as well. Please take a few minutes to browse my blog and feel free to ask questions. Enjoy! I was wondering if you could give me an email address I can reach you at so that I can ask you a few questions about blogging for Brock. Or perhaps we could connect on Facebook? If yes, I’ll send you an address to get a hold of me. Thanks!